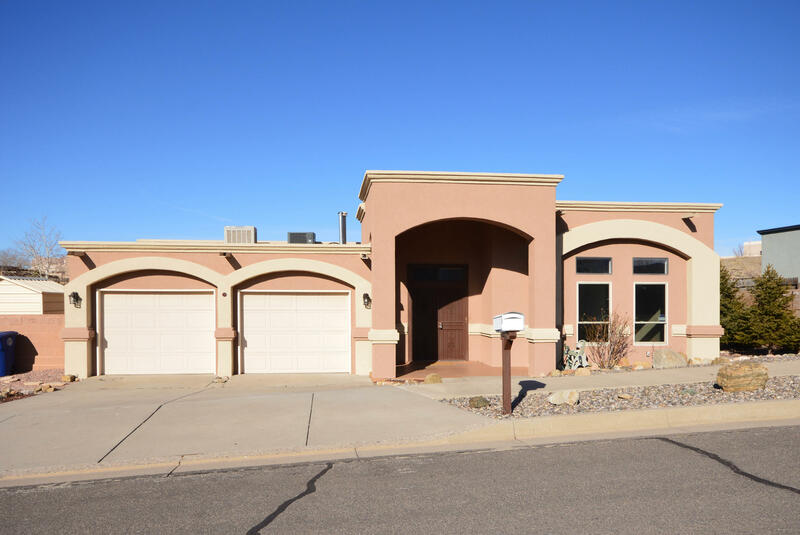 415 Narcissus Place SE, Albuquerque, NM.| MLS# 936068 | Albuquerque Real Estate Company Specializing in Residential Home Sales & Buyers Representation, Commercial Sales or Acquisition, and Commercial Property Management. Call Real Estate incorporated (505) 433-3100 for all your Real Estate needs! This lovely custom Four Hills home has a large greatroom and a large dining room separated by two-way fireplace. Kitchen has stainless appliances including gas stove, updated light fixtures and breakfast bar. Spacious master suite has fireplace, covered patio access, large walkin closet and bath with dual sink vanity, large jetted tub, separate shower and floor with radiant heat. Home has atrium off of dining room and leads to huge covered deck. Backyard has two storage sheds, fruit trees and has gated access with room to park an RV or boat. Upgrades include windows, hand honed wood flooring, new water heater and stucco in 2017 and new roof in 2018. DIRECTIONS: From Tramway, East On Central To Carmellia, Right To Narcissus, Left To Home.